The NBA – where the amazing happens! Yeah, right! Only if by amazing the NBA means the “Amazing Adventures of the Referees.” Last night’s Game 1 of the Eastern Conference Finals between the Boston Celtics and Miami Heat was an absolute abomination. I think the Celtics got the memo from the league: the fix is in. It was clear the refs were told, at all costs, do everything possible to make sure the Miami Heat win and make it to the Finals. If – and it is a big if – the league didn’t put the fix in, why wouldn’t every one of these officials be fired and fined for last night’s tyranny? Jeff Van Gundy, who is not the biggest fan of the Celtics even commented on the ridiculousness of the officiating. There wasn’t a fan, player, coach or analyst who thought what the refs were calling was even close to being correct. It seemed that some of these calls were coming out of thin air. Stephen A. Smith, who I consider a good basketball analyst, was in disbelief on both the Ray Allen and Doc Rivers technical fouls. At one point, it almost felt like LeBron James purposely missed a technical free throw due to how bad the officiating was. Now, let’s discuss that egregious technical foul called on Ray Allen. Allen has been called almost universally a pro’s pro, and one of the most professional athletes in all of sports. Did Ray Allen get in the face of the official after the call? No! Did Ray Allen swear at the ref for the call? No! 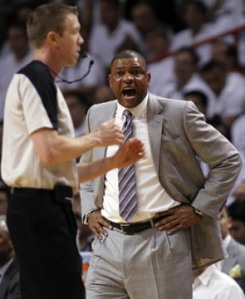 Did Ray Allen go insane or create a scene after the call? No! He reacted as he always does, as a professional. He jumped up in the air away from the officials in frustration. Mind you, AWAY from the officials. Basketball is a competitive sport and, as such, people have emotions that they display while they play. Does the NBA want robots? We talk about how athletes today don’t care enough about the sport and they only care about money and the business side of the game. Is the NBA not sending the wrong message here? These are people and they are going have emotions and react to things. Heck, we want them to. That adds to the excitement of the game. I don’t even want to get into the lack of calls that were given to the Celtics in the third quarter when they were driving to the lane. I don’t believe Paul Pierce or Rajon Rondo got a single foul and there was a ton of contact on those drives. I am not saying the Celtics would have won because they did not play well and deserved to lose based on how they played. I will say the officiating definitely affected the game. The Miami Heat played great … or, shall I say, LeBron James played great. The sad thing about that is I will not remember how great LeBron was in this game. I will remember how bad the officials were. As a fan of the game of basketball, that is hard to say. For years now, fans and analysts have been crying about how bad the officiating has become in the NBA. It is so bad, it leads people to speculate that the referees are purposely intervening in the games for their own ego, personal benefit or the league’s benefit. What you do know, an official, Tim Donaghy, was even convicted and went to prison for betting on games. The NBA would like you to be believe he was the only one, that the officials do a great job and don’t have any ulterior motives. What an insult to the fans that pay to watch the NBA, to think that we are that naïve. I think the league needs a definition to what that means. We pay to watch very talented athletes do what we wish we could do on a basketball court. Hence, the “B” in NBA stands for basketball. Last time I checked, the referees don’t play. Why? Simply because they are not talented. I grew up in a city where sports are a religion – the city of Boston, home to the Boston Celtics, Boston Red Sox, New England Patriots and Boston Bruins. This is a place where, not only do we argue about our teams being better than other city’s teams, but we also argue about which team in our own city is the best and what sport is better to watch. Well, I think I can officially stop arguing that basketball is the best sport to watch after last night. The officiating just ruined the game and the sport to the point where it is almost unwatchable. The NBA has become a joke. At the forefront of the joke is David Stern. The once great commissioner who took the sport and made it internationally known, is now the one who is destroying it. I ask Mr. Stern to do something about it: Step up to the plate and admit that you have made mistakes in the past with officiating and rectify them. Don’t sit by while the sport you have invested your life into gets tarnished. Do it for yourself, do it for the fans and, most of all, do it for the love of the game.